We arrived in Darwin, the 3. of July 1996. Two days later we were the owner of a Toyota Landcruiser HJ47 Troopie. A coupple of days to get the car and us, equiped for Outback-travelling, and we were heading south and west. A short look at Kathrine Gorge and the next day we arrived in Kununurra in Western Australia, to meet sister Anne and brother-in-law Ove. They started out in Perth 2 month earlier, on a 250 Suzuki and a GS1000 BMW with sidecar, which served as their lugage-carrier. During the stay i Kununurra, we visited Lake Argyle, Ivanhoe Crossing, Hidden Valley, The Grotto and Wyndham. Ulla and Michael and the 15 year old Toyota Landcruiser HJZ 47. All 4 ready for the 1000 km dirt road across the Tanami Desert..
As former Africa-volunteer and familiar with dirt-roads, Ove started out at Gibb River Road on the sidecar-BMW, at near racing-speed. Anne and us in the Landcruiser, needed some time to get used to the dirt and not least the corrugation. This turned out to be the only thing, able to harm the good old Toyota. We visited many of the Gorges along the 700 km through the Kimberleys, and the exiting Flintstone-like campground at Ellenbrae Station. Lower and Upper Maning Gorges, Bell Gorge and Windjana Gorge were among the best places for overnight stay. At Windjana we discovered, that the corrugation had broken the frame around the main cooling radiator. Fortunately, Ove har brought the few things, necessary for welding by using the electric power of the batteries. It is so nice to see sealed pavement after a week on Gibb River Road. On to Derby and the famous Prison Tree, an enormous hollow Boab-tree. Further west to Broome, for relaxing a week at the beach. A good check-up of motorcyclers and car, and we are heading east. Fitzroy Crossing and Geikie Gorge is an interesting stopover, travelling the Great Northern Highway along the edge of the Kimberley plateau. We were advised to spare our own vehicles from going to Bungle Bungle National Park. In Halls Creek we booked in on a guided tour in an Australian build OKA 4-WD. A very good idea, it was a extremely rough tour, but it turned out to be the most unique place we saw on our Australia-tour. 1040 km says the road-sign, where Tanami Track takes off a little south of Halls Creek. It is not too bad, people said. But it was very much like the Gibb - just longer ! Carranya Homesteadt is one of the very few places for a safe stay, and the evening is the best time to visit the 850 m wide Wolfe Creek Meteorite Crater, 20 km´s away. 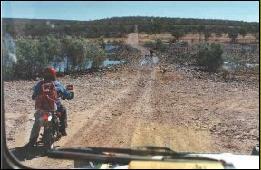 Next morning we vere asked to look after a German motorcyclist, who seems to be in trouble about 100 km further down the track, and they allso recommended us not to camp until we got to Rabbit Flat, because of unfriendlines among the Aborigines in the area. We picked up "Wolfie", as we called him, carried his extra petrol in the car, and reached Rabbit Flat just after sunset. But on the rough track the radiator-frame colapsed again, we had to tie it with rope to get there. It was wednesday afternoon, and "The Rabbit" would not open until friday morning, but never mind, we found a resonable place to camp, opposide the wind, trying to advoid dust from the passing Road-Trains. After all, we needed a whole day to repair the frame, it was quite a job, most of the front end of the car had to be dismounted. Ulla found just the right pieces of sheet metal, and Ove did a very fine job with the "Bush-welder". He welded about ½ meter by using the batteries from the car, and when everything was back in place, the big 4-litre diesel engine started without problems. After a good night sleep in a very soft bed i Tilmouth Roadhouse, it was a pleasure to get on sealed road and soon be in Alice Springs. We had to clean quite some dust out of the car, before going into town, but we were lucky to be there right on time to see "The Gahn" (the legendary desert-train from the south) coming in. Time were about to get short. We dicided to do Ayers Rock on a guided bus-tour. 1000 km in one day visiting The Olgas and The Rock is a very long one, but two good guides, not too many people and a comfortable bus, made it an interesting day. We said good-bye to Anne and Ove in Alice and headed north. A punkture, a minor repair of the starter-motor and 1500 km Stuart Highway brought us to Kakadu. Yellow Waters and Nourlangie Rock (Aboriginal paintings) were among the places we had a good look at in Kakadu. Back i Darwin we just had to sell the car. This was done in 3½ days, not the best price, but after all, this was the cheapest way to have a car like that for almost two month and 6000 km. We still had a few days to spend in Darwin, a good opportunity to see Litchfield National Park in a rental Toyota RAV-4. The "Extremely Rough Track" to Lost City was EXTREME. We found out, that even an allmost new car makes a lot of noise and feels like falling apart on the corrugation. We are happy, we made it - in a 15 year old car, with charme and style. As a good guidebook for travellers in the Outback we can recommend Lonely Planet's OUTBACK AUSTRALIA. The radiator frame is broken again. Fortunately Ove had his "Bush-welder" in the sidecar. The small fueltank on Anne's Suzuki, had to be filled every now and then. The Toyota was our home for allmost 2 month and 6000 km. National Park in the tiny RAV4. This is dry-time, otherwise Pentacost River would be several meters deep. What do you think of the story ? What is your own plan for travelling ?